The archbishops of Canterbury and York have written to Tony Blair criticising coalition troops' conduct in Iraq. 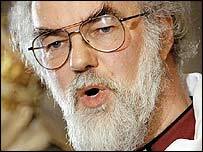 Dr Rowan Williams and Dr David Hope wrote the letter on behalf of the 114 Anglican bishops. They say the abuse of Iraqi detainees has been "deeply damaging" and the apparent double standards "diminish the credibility of western governments". Downing Street confirmed it received the letter and said the archbishops were "entitled to their own views". Mr Blair's official spokesman said the prime minister had not replied to the letter and would consider the comments in due course. He stressed that Mr Blair too had expressed his abhorrence to anybody mistreating prisoners. Investigations into abuse allegations had begun before the claims were published. The letter, which was leaked to the Times, was sent after a meeting of all the Anglican archbishops and bishops in Liverpool three weeks ago. It reads: "It is clear that the apparent breach of international law in relation to the treatment of Iraqi detainees has been deeply damaging. The Bishop of Southwark, the Right Reverend Tom Butler, said the letter had been sent privately to Mr Blair to "avoid a great public confrontation". "We felt that because our government had really been very firm about the war in Iraq coming for moral reasons that the treatment of Iraqi prisoners was undermining the whole moral argument," he told Radio 4's Today Programme. It was also conceived to urge the British and American governments to establish and maintain the rule of law and to bring those responsible for the prisoner abuse to justice, the bishop added. Christians in the Arab world were "deeply disturbed by what they have been seeing on their television screens", he said. They warned of the danger of losing Britain's role as an "honest broker" in the conflict. A Church of England spokesman said that the letter had not been intended for publication. He said the letter was "intended as a positive contribution to the development of government policy following that transition [of power in Iraq]". "The Archbishop of Canterbury led the attack"